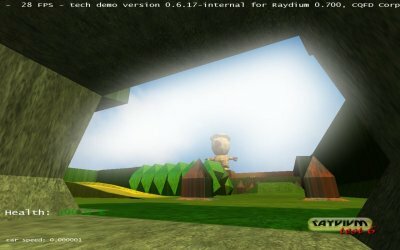 Raydium 3D Game Engine • View topic - Pseudo HDR trouble. Post subject: Pseudo HDR trouble. I'm using the engine for quiet some time now, but I never saw the HDR effect in real, just on some screenshots. That is probably, because I didn't manage to get it enabled correctly. First picture is from the API reference that shows the effect I want to see. On the second screenshot you can see what it looks like on my system, which has a NVIDIA GeForce 8800 GS with 512 MB if this matters, using all methods from above. I've found some posts on the forum with the information that HDR is in an experimental state, perhaps it's disabled on build time or something, but quickly looking at the code I didn't found a solution. Likely I'm doing something stupid or have oversight some important detail. Post subject: Re: Pseudo HDR trouble. Experimental, but supposed to work. If the above test does not works, you may try to debug hdr.c. There's very few vars to follow, it should be "pretty" easy. I'll have a look with you in this case. Maybe are Glut function involved? And so, Another unsupported glut function in mac? Today I've followed your test instructions on different systems. They all have installed the newest video card driver versions from the chip manufacturers. On a notebook running Windows Vista 32-bit which has an older ATI Mobility Radeon X600 with 128 MB I successfully saw the effect the first time at all. It looks really impressive! Sadly no success on different Apple systems here, including the iPhone, so I guess it's related on the ports and I'd exclude the hardware. Which was the first unsupported GLUT function? As I have already tried to explain the last time: No Apple related Raydium executable file is compiled or linked with GLUT! You can look at the build scripts yourself if you don't trust me. Probably you mean the related MyGLUT functions. Of course there could be a problem with them, apparently something is broken and I'll try to find a solution why HDR is not working here at all. I'll begin the bug hunting session looking at hdr.c. Thanks for your help, of course it was an issue with the context creation. Mac OS X: Fixed with Raydium revision R893. iPhone OS: Stencil buffer is available via the OpenGL ES extension #33 called GL_OES_stencil8. I'll leave this as is for now, so when someone needs this extension it can be activated manually. BTW: The --hdr on/off CLI option seems to change nothing. Tested on Mac OS X and Windows Vista 32-bit. Oops! You're right! I've mixed up the CLI options with the *.conf configuration ones. Setting hdr="on" or hdr="enable" in the config works great.